I. Garden State Pkwy. S to Exit 159, Rt. 80 W. Travel 7.3 miles to Exit 53, Rt. 23S. II. Take Rt. 23 S. through Rts. 80 and 46 intersections. Then proceed 1.5 miles to the fifth traffic light. Turn right at light onto Lindsley Rd. then immediately fork left onto Mountain Ave. Travel south 3.3 miles to the end. Turn right onto Bloomfield Ave., [aka Rt. 506]. The Birthplace is 1/10 mile on the right, across from a Dunkin' Donuts. House is tan w/ green shutters. Parking lot is at end of gravel driveway, near our brown barn. Take Rt. 23 S. Use the directions listed above, starting at Roman Numeral II, Rt. 23 S.
OR Take Rt. 287 S. to 80 E. then use the bottom set of directions, coming "From the West". Garden State Parkway N. to Exit 145. Follow signs for Rt. 280W. Travel 4.4 miles on 280W to Exit 7. Stay right on ramp and follow signs to Verona. (You are now on Pleasant Valley Way. The road's name will change to Lakeside Ave.) Continue north 2.4 miles on Pleasant Valley Way/Lakeside Ave. to the end. Turn left onto Bloomfield Ave., [aka Rt. 506]. Travel 1.5 miles west on Bloomfield Ave. The Birthplace is on the right across from a Dunkin' Donuts. The house is tan with dark green shutters. Parking lot is at end of gravel driveway, near our brown barn. New Jersey Turnpike N to Garden State Parkway N. then use directions above coming "From the Southeast". OR Rt. 287 N. to Rt. 80 E. then use the bottom set of directions coming "From the West". Take Rt. 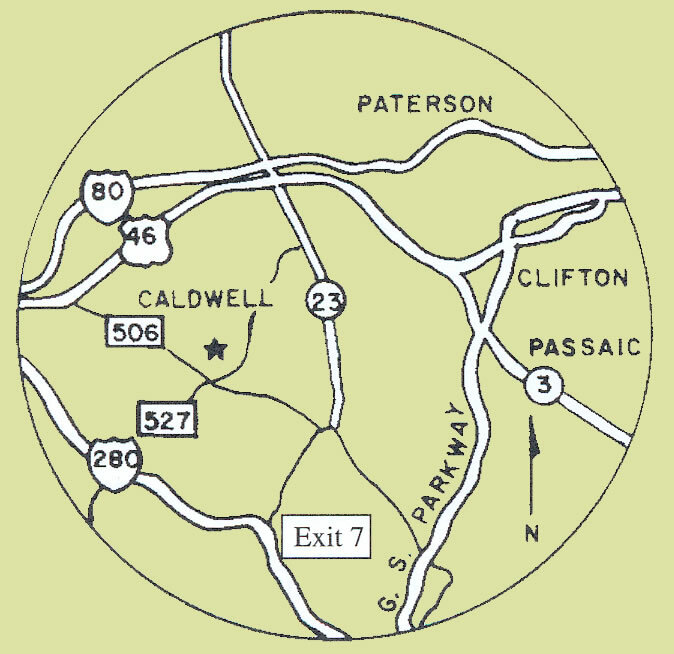 80W to exit 53, then use directions "From the Northeast, Roman Numeral I, Rt. 80 W", at top of page. OR take Rt. 46 W. to 23 S. then use directions "From the Northeast, Roman Numeral II, Rt. 23 S.", at top of page. Rt. 80 E. to Exit 47 B., Rt. 46 E. Drive 2 miles on 46 E. to right hand fork, [Bloomfield Ave. aka Rt. 506] following signs to "Bloomfield Ave. The Caldwells". Travel east 3 miles on Bloomfield Ave. [aka Rt. 506], passing through West Caldwell, and the business district of Caldwell. The Birthplace will be on the left across from a Dunkin' Donuts. House is tan w/ grn. shutters. Parking lot is at end of gravel driveway, near our brown barn. Mondays and Tuesdays, All state and federal holidays and Wednesdays following Monday or Tuesday holidays. Visitors are encouraged to call ahead for site hours. Reservations are required for all groups of 10 or more people. Please do not climb fences or trees. Strollers must be left outside of the historic buildings. 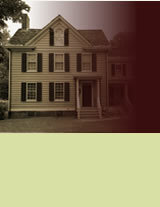 Smoking, food or beverages are not permitted in the historic buildings. Handling of artifacts and interior photography, video taping or audio taping are not permitted. Your cooperation will help ensure the survival of the museum collections for the enjoyment and educatio of future generations. Temporary facilities located on site.